Hunkering down under the hood of my overcoat, as we hot-footed it towards the car after Sunday’s disappointing last minute defeat, I felt sorry for the poor police horses, visibly flinching in the face of a vicious downpour of hailstones the size of marbles. The ostriches who pooh-pooh the consequences of climate change should have been with us, walking across Stanley Park, over a bizarre carpet of what looked like those polystyrene packing balls, covering the grass. With the scent of summer in the air with last week’s warm weather, I was beginning to think I could’ve waited until next season to purchase my new padded coat. Yet with the loudest chant of the afternoon coming from the Gooners below us in the Lower Bullens “jump up if you’re f***ing cold”, boy was I glad of such sensible protection from the elements. At the time of buying it I recall thinking that a microchip in its lining to ensure I might be rescued in the event of an avalanche, was just a little superfluous. However as we sat in the motor, stuck in the car park for over an hour, feeling equally sorry for ourselves, wondering how many different seasons the 4-hour journey home would have to throw at us, I was beginning to think this microchip might come in handy, until this intense hailstorm eventually abated. Feeling a little guilty, I offered to take the wheel for the return trip south. If my mate John hadn’t responded to my plea for a lift, late on Saturday evening, he would’ve been tucked up at home in the warm. I tried to persuade him that this miserable end of season outing was truly an example of paying ones dues. It would’ve been so much easier to have stopped indoors and watched this match live on the box, with ones feet up in front of a toasty fire, without having to endure a treacherous eight hour round trip trek. However, unlike the far too many fair-weather fans, who’s disappointingly shallow commitment to the club doesn’t even extend to stopping at home games for the duration, as they’re more interested in avoiding the queues at the station than supporting their team to the death, when success next comes the Arsenal’s way, it will be the couple of thousand hardy Gooners at Goodison on Sunday who'll truly feel they have earned it. Although in saying that, apparently Old Trafford played host to a embarrassingly meagre turn out of only 834 for the quarterfinals of the FA Youth Cup, while over 11,000 watched our youngsters gun down a doughty Cardiff side. Moreover while savouring our first XI’s somewhat fortunate victory against Martin O’Neill’s Villa in the Midlands on Wednesday night, I was absolutely flabbergasted to discover that there was a record breaking crowd (for a Youth Cup match) of over 38,000 back on my doorstep in London watching the kids beat Man Utd 1-0 in the first leg of the semi-final. With tickets at only £3/£1 (adults/kids) in advance and £10/£5 on the night, admittedly this guaranteed that there were thousands of kids present, who were perhaps enjoying their first trip to our new stadium and an introduction to the Gooner faith. However for a club that’s supposedly on the floor after a disastrous couple of weeks and who’s fans, according to the media, are supposed to be in open revolt, this was a significant show of faith, both in the club and in Arsène Wenger’s vision for the Arsenal’s future. I imagine that it must’ve felt somewhat discomfiting for our North London neighbours that our Youth Cup campaign attracted 5,000 more than the number of Spurs fans that bothered to turn up at White Hart Lane to watch Tottenham progress to the quarterfinals of Europe’s Mickey Mouse competition and only a couple of thousand less than the number of fans watching with me as we took all 3 points at Villa Park. I was gutted because I rarely arrive at matches in time to see the warm up and I could’ve taken some marvellous photos, as Pat Rice placed the cones for the players to run around, almost within touching distance. Yet despite an infinite number of pixels and several million megabytes of computing power, it appears that without a masters degree in technology, the ingenious bit of kit that is my mobile phone is absolutely useless in my incompetent hands. By the time I managed to get the camera working, the lads were already walking back to the dressing room. Worse still, only on route to Birmingham, I’d been whinging that the players only ever seem to throw their shirts into the crowd on the rare occasions when I’m not present, or when I’m sat right at the back of the stand. Obviously I’m deluding myself, but as he headed towards us after the final whistle, I was convinced Denilson was intending to reward me for my humble efforts to make him feel at home, by encouraging him in Portuguese. If only I was six inches taller, as I’m certain that some lofty Gooner is now walking around in (or offering on eBay!) an Arsenal shirt, which had my name on it (well Denilson’s name on it, but you know what I mean), as it only just eluded my outstretched fingers in the scramble to retrieve it. Doubtless it will be another decade before an opportunity to bag such precious treasure presents itself again. Although by which time I might well be entitled to the sympathy vote and they’ll be walking over to present their shirt to me in my wheelchair! It’s a loyal football fan’s lot to be a naïve romantic but following recent disappointments, I honestly believed our victory at Villa might prove to be a turning point. With good fortune smiling upon us once again, in those few moments of mutual admiration after the final whistle, I thought I sensed a new found “the rot stops here” type resolve in the eyes of the Arsenal squad. And yet with Wenger down to the barebones of two strikers with only a solitary Premiership goal between them, I guess we were always going to struggle at Goodison. However the consensus of opinion would suggest that our task wasn’t made any easier by Le Boss’ bizarre choice of a backline where only Gallas was playing in his natural position. Watching the incredibly incisive counter-attacking of Rooney and Ronaldo on Match of the Day reminded me of what we’ve been missing for much of the season, as we’ve grown all too accustomed to the seeing any thrust of the Arsenal’s forward play falter on the edge of the oppositions penalty area, while we plead for someone to take responsibility. You can’t fault Aliadière’s work rate and the faith that’s been shown in him suggests he must be a gifted player, but where Andy Johnson is blessed with the opposite polarity that ensures the ball is constantly attracted to him, Aliadière appears to suffer from the exact opposite. In such awful conditions it’s hard to attach any individual blame for Everton’s goal. 9 times out of 10 Johnson’s shot would’ve rebounded off all those bodies in the box, but unfortunately for us he happened to find just about the only gap in the Gunners bulwark. However after hitting the woodwork twice, it was hard to deny that the Toffees deserved their goal. As usual we dominated much of the possession but failed to make this pressure count. For my money the difference between the two teams was encapsulated in a first-half incident involving Fernandes, where he battled with first Diaby and then Fabregas, and his determination to retain the ball spoke volumes. In the end it was this desire that won the day, as while the Gunners were looking to the strange stuff falling from the heavens, waiting for the final whistle that would allow them to seek the sanctuary of the dressing room, having long since settled for a point, the home side were having none of it, having sensed that they might take advantage of the fact that we’d already switched off. We can but hope that the price of this lesson in playing to the final whistle does not prove too costly and that it is a lesson learned which might serve us well in future. With such weird weather and Spurs still involved in two cups, some might conclude that the end of world is nigh. Me, I’m battening down the hatches and waiting for the inevitable winds of change. In the last day it has been may be the only article just talking about the game and our team, not trying to prove Wenger is right, not trying to prove we should kill him. A nice view, in particular coming from a gooner that invested the time, the money and the energy to be there and show our supports to our lads. 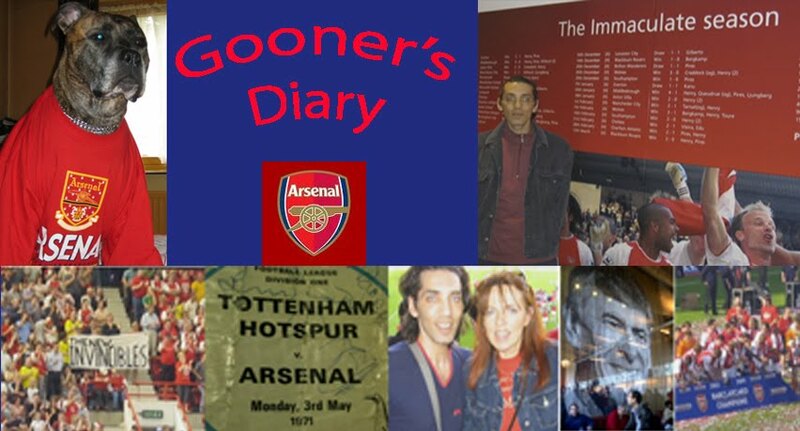 But specially THANK YOU and THANKS to all gooners who went up to Goodison Park, YOU DID GREAT!!! You always overshadow local supporters!!! Proud to be a Gooner!